Make sure your party guests know exactly where to go with an envelope made from a map. 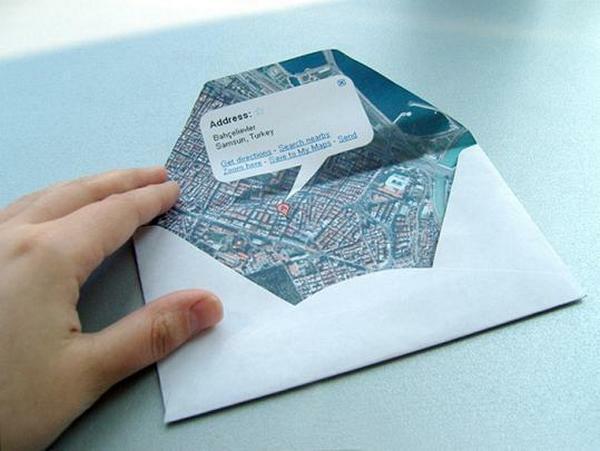 Graphic designer Beste Miray came up with the idea of creating an envelope from Google Maps that, when opened, shows a satellite picture of the geographical location of where the letter came from. The envelopes are a cinch to make (I tried it and can report success) and once you know how to fold an envelope from a single piece of paper, one-of-a-kind stationery might be your thing. Get folding!